Even though I understand barely a word of Arabic, I can see that these sisters know how to get down and have a good time! 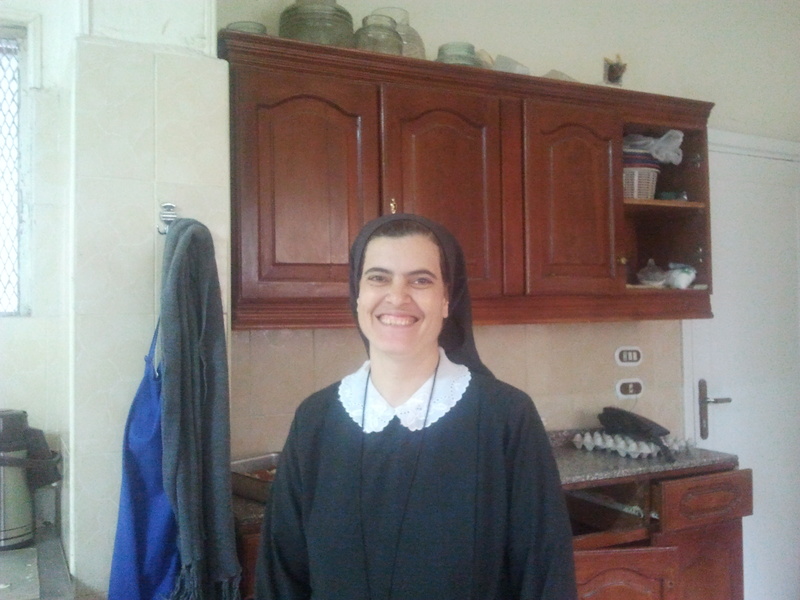 They laugh a lot at the dinner table, when Sister Maria allows conversation. They laugh and converse afterwards. Sometimes I think they’re gossiping about some sister or other, but there doesn’t seem to be any bitterness among them. The sisters don’t all eat together. Some are off at various jobs, or not available, so you never know how many will be at the table. For breakfast, served at around 8 am, we usually have pita bread and a couple kinds of cheese. One is a really strong, salty cheese. Nagette, who lives with the sisters, indicated to me that if she eats this cheese she throws up. I find it pretty unpleasant too. The other cheese is more like a creamy version of feta cheese. They tear off pieces of rucola, tear off a little bit of bread, a little cheese, and eat it all together. There are usually hard-boiled eggs from Mariem’s chickens on the table. The sisters drink black tea for breakfast. 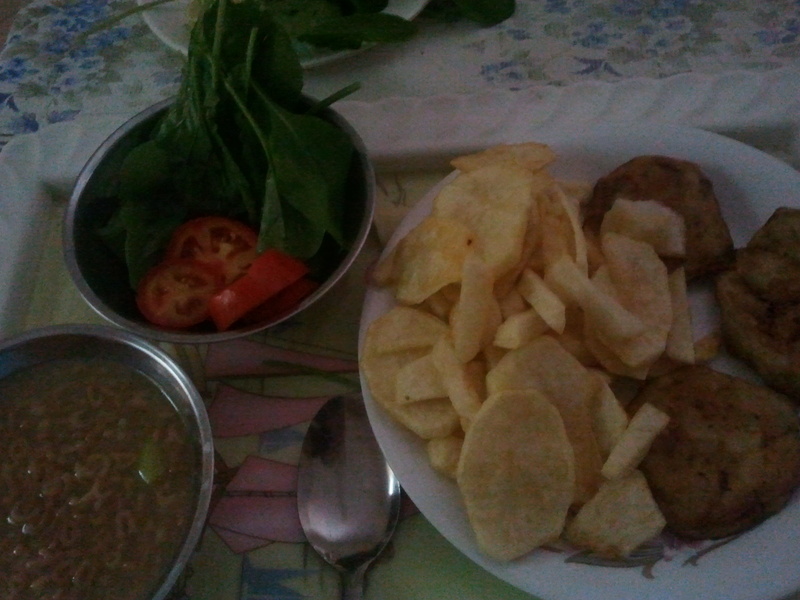 Sometimes they get foul – cooked fava beans – for breakfast, which they eat with pita bread. This is a real highlight for them. Then out come the limes, oil, tahini, cumin, and salt, which make foul a tasty meal. Lunch, at 2 pm, is the highlight of the day. We have chicken about every other day or so. The sisters don’t eat pork. They don’t like it, Sister Maria tells me. Sometimes they eat is stewed beef. The sisters eat soups like a green bean soup or the famous molokhaya, to which they can add rice, or just pile some rice along with their chicken or other meat. The rice is always a combination of rice and vermicelli noodles. Once or twice we’ve had a meat-filled dish something like puff-pastry quiche. Sometimes, particularly on Fridays, the food is vegetarian. It can be a macaroni dish, or French fries. There is always fruit for dessert. The evening meal, served somewhere between 8:30 and 9 pm, is usually the same as breakfast, but sometimes there is a raw vegetable like cucumbers or tomatoes. There is also usually plain yoghurt, served in glasses. Sister Ologaya, who directs the hospital during the day, makes the the yoghurt every evening from milk and a starter she buys at the market. After the meal, the sisters collect their dishes and the leftover food and water pitchers, bringing it all into the kitchen. Then someone starts hand-washing the dishes, while someone else rinses and puts the dishes onto a drying rack hanging from the wall. A third person will put the dishes away. The first week I was here, I wasn’t allowed to help at all, but by now they let me help in the kitchen. 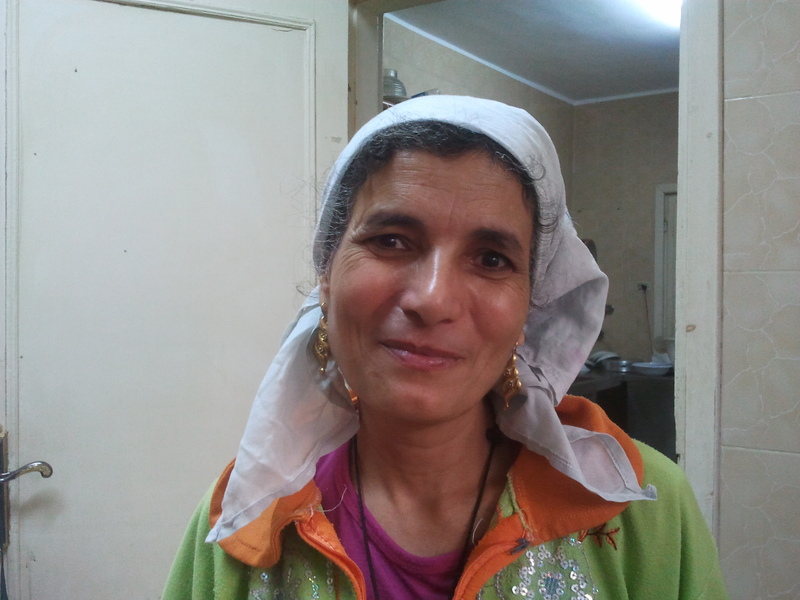 Marsa, the cook, came to the convent as an orphan. I’m not sure how old she was at the time, but the sisters adopted her as their own sister. She is always smiling. Every day she has a new English phrase for me, with something in Arabic she wants me to learn. I love this beautiful, tender woman. She works very hard in the kitchen. For some reason I can’t discern, she doesn’t eat with the sisters. I know she is beloved by them. Still, they can be pretty hard on her when she neglects to do things they really want, like warming up their pita bread in the oven. Martha’s cheery statements she reads to me, messages like, “You are welcome here anytime! Please sit down.” are part of why I love this place.